Biology is the scientific study of living organisms and deals with every aspect of life. During the course you’ll examine the physiology of the human body and how it’s affected by disease and drugs. You’ll study the structure, biochemistry and mechanics of the cell, as well as evolutionary processes and genetics, both in mammals and microorganisms. As you progress, you’ll choose from a wide range of modules including blood sciences, pharmacology, microbiology, immunology and drug discovery. You’ll also have the chance to study abroad or take a year’s work placement, either of which will boost your employability. Ultimately, you’ll gain the technical, analytical and practical skills needed to investigate biological phenomena in microorganisms, plants, humans and animals. This degree is accredited by the Royal Society of Biology. Biology is a discipline with a broad range of applications affecting many areas of human activity. You will study life at all levels from molecules, through organelles and cells, to whole organisms. You will gain the technical, analytical and practical skills needed to investigate biological phenomena in microorganisms, plants, human beings and other animals. The Biological Science programme offers you flexibility and a broad range of options for study. The first year provides a solid foundation in all aspects of biology including topics in areas such as physiology, biochemistry, genetics and cell biology. It also gives you an opportunity to start developing your practical skills in the laboratory. At second and final year you can choose from a range of modules from across our biosciences courses according to your particular interests. The degree provides a stepping stone to a wide range of scientific careers, including teaching. Our graduates are highly sought after. They find employment in the pharmaceutical, food and drink, agrochemical and biotechnology industries, as well as in industrial, academic and charity-funded research. Jobs include drug safety coordinator, lab scientist, microbiologist, research assistant and donor transplant assistant. 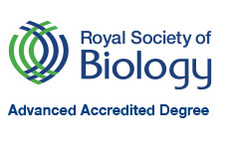 All Biosciences graduates in Biological Sciences are eligible for graduate membership of the Royal Society of Biology. This programme has been accredited by the Royal Society of Biology. Advanced Degree Accreditation by the Society recognises academic excellence in the biosciences, and highlights degrees that educate the research and development leaders and innovators of the future. The Advanced Accreditation criteria require evidence that graduates from the programme meet defined sets of learning outcomes, including gaining a substantial period of research experience. Our Biosciences graduates are highly sought after by employers in the industry due to the reputation of our teaching, the vocational element to our degrees and the fact that many of our students already have a year's work experience when they graduate which they gain in the sandwich year. Graduates can find employment in the pharmaceutical, food and drink, agrochemical and biotechnology industries as well as in industrial, academic and charity funded research. Some graduates also go on to work in health care and environment agencies. First salaries range from £12,000 to £22,000 pa. In your final year you will normally have the opportunity to hone your independent study and interpersonal skills by undertaking a major project or dissertation. All Biosciences students have the opportunity to undertake a work placement or study overseas in Europe or North America during their third year. University of Hertfordshire: Biodeterioration Centre - Hatfield. Katholieke Universiteit Nijmegen - Nijmegen, The Netherlands. West Virginia University - USA. There are no compulsory additional expenses for this course. Where you will use an EVS handset, Lab coats and log books, these will be provided as part of your course fees. Including 2 science GCE A Levels (or equivalent) one of which must be a grade C in either Biology or Chemistry (acceptable Science A levels are Biology, Chemistry, Human Biology, Maths, Physics, Geography, Psychology, ICT, Sports Studies). BTEC Extended Diploma in Applied Science (depending on optional units studied) with DMM profile. Access to Science Diploma with 45 Level credits at merit profile. IB at 104 points from a minimum of 2 HL subjects at H4 or above to include Biology or Chemistry and one other Science (with the remaining points to come from a combination of HL, SL and Core). Plus GCSE English language, Mathematics and Double Science at grade 4 (C) or above (or 2 single sciences). A minimum IELTS score of 6.0 is required for those for whom English is not their first language.